It;'s Tuesday, so time for the Tuesday Throwdown challenge- this week we are using our favorite color! I have always loved Pink, I also love Blues....if I had to pick one- Pink would win! This week, our sponsor is Kitty Bee Digital Stamps. 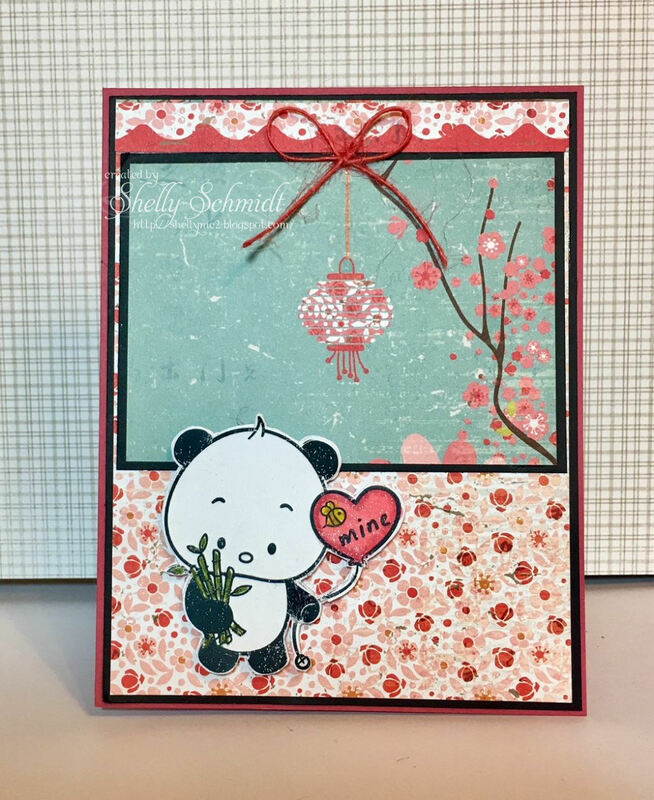 I used an image called Panda Balloon and Bouquet. I found the DP in my stash- it is by Basic Grey. And, it is pink (and blue) : ) For me, this is quite CAS and would also be perfect for Valentines Day. I hope you will come join us- and take a look at the other DT members great cards- wonderful inspiration! 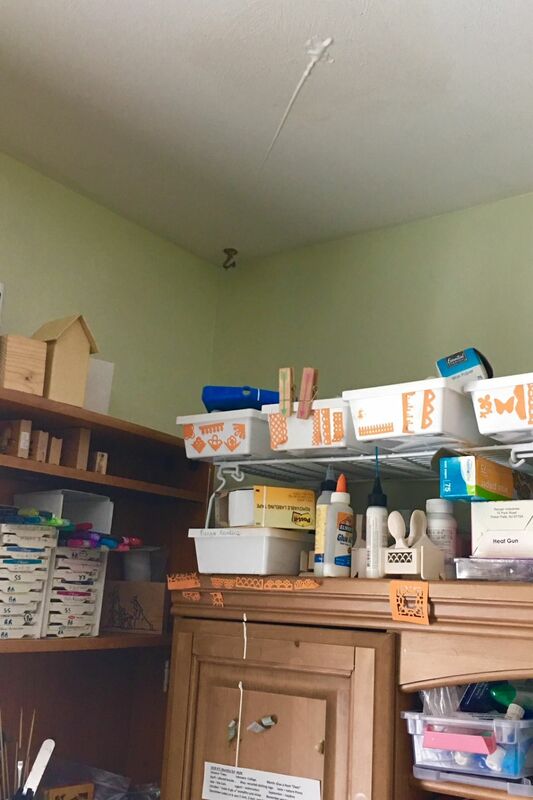 It's the 28th of the month, and it is time to Create with Your Stash, aka CYS. 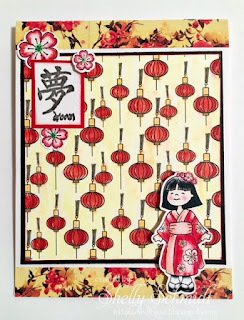 This month Jeanette challenged us to use 3 different patterned Papers on our cards. Since the goal is to use 'stash' items, I pulled out DP from my drawer of unknowns, and cut out butterflies with the retired (ages ago) SU Beautiful Butterflies Bigz Die. I layered them over a die and embellished them with Basic Grey pearls. The cardstock is SU as well. 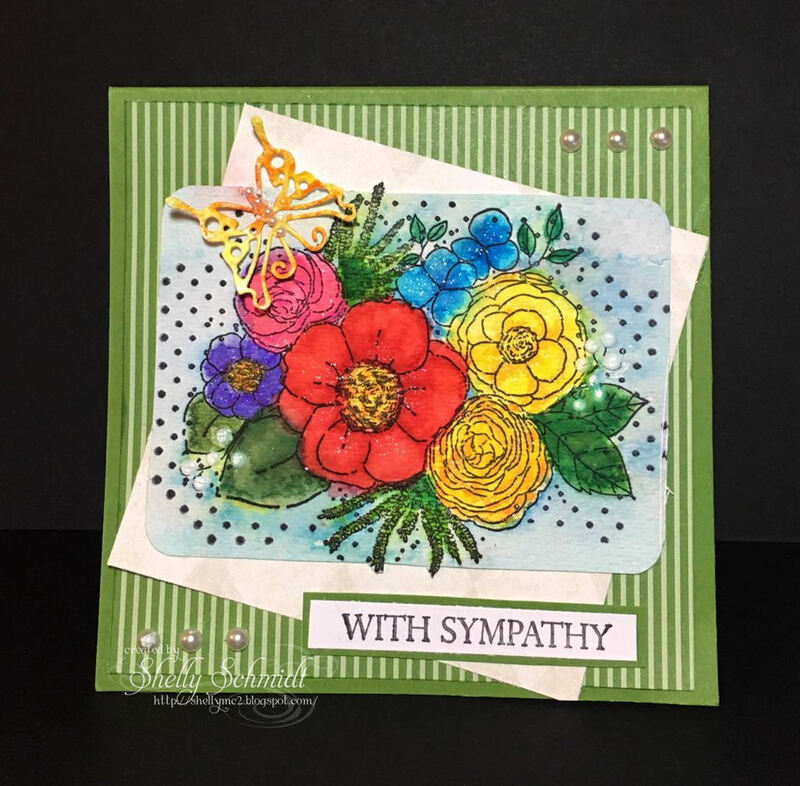 The Sentiment is Unity by Gina K. I also added a sympathy sentiment from the set on the inside. 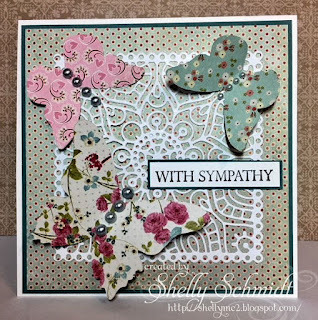 I am in need of a few more Sympathy cards. In the days of working in Intensive Care, I remember Jan was such a busy month for our unit! The CYS group can be located here. 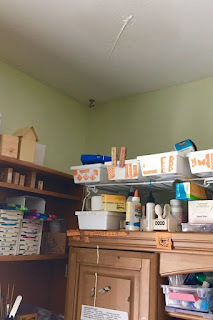 List mom Barb had the brilliant idea- lets use our stash items- with a monthly theme, I am sure finding no shortage of items to use in my creative space for this challenge...!!! Even those in the 'get rid of' pile....... HERE is a link to all of the January- 3 different DP cards'the group members posted on Splitcoast for this challenge. 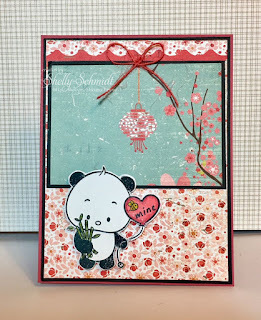 Gerda Steiner Progressive Challenge for Jan., Oh I could not resist the adorable Panda- so I bought him! 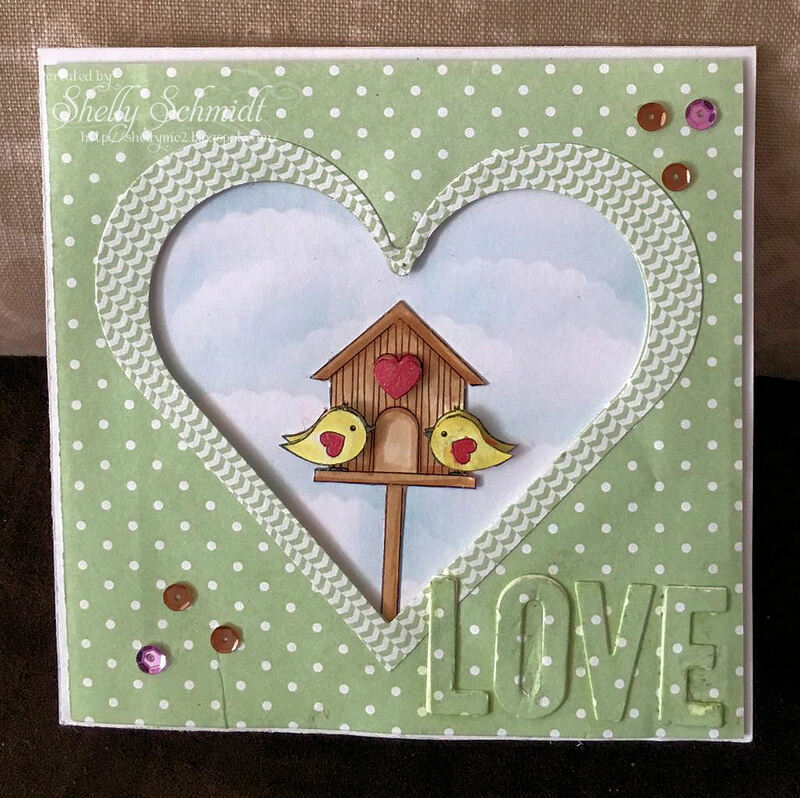 Inspired by a blogging friend- Donna, who makes the cutest cards with the images from this store! I used a background that is made on watercolor paper with the leftover paint from my attempts at watercoloring. Why waste the paints- they are not cheap! 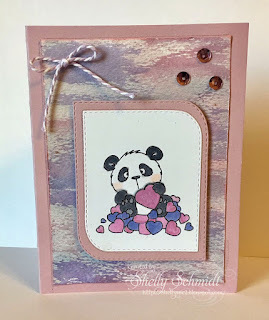 I love the pinks and purples- and was able to match the mauve/pink cardstock-that my sistaer gave me from Tuesday Morning. I used a Mod Stitched rectangle die for the image, copics to color and a Spectrum Noir Sparkle pen to add shimmer. Our Jan ATC theme was trees. I used a variety of backgrounds for my trees- having so much 'technique' fun! On the Lt, the ATC is made using a chipboard tree from Sweet Stamps- Piccalo Accents. I covered it with enamel EP and it has flecks of gold in it. I placed it on a background and covered the edges with Stickles. On the Rt is my 1-4-1 "drop card". I used a Distress Ocide BG, added a portion of a die cut of a city scape, colored the house and trees. I added 'snow' on the trees using my white paint pen, then felt like it needed something, so added dots of snow with the paint pen and a full moon (It is the Blue Moon month after all). 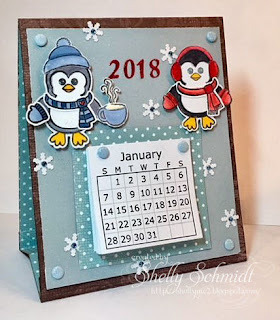 On the Lt- the background is a gelly plate Background, used a tree die cut, I added dots of snow and snow on the tree with a white paint pen. I added Washi tape at the bottom. I added a star at the top from retired SU sequins. The Rt ATC is my favorite- I added a background of a magazine page wrinkled up, laid flat and covered with Gesso. I added the tree die cut, added pink heart sequins. I added punched hearts at the base from some retired SU DSP. These tree dies are unbranded. They are from a set of three. The one on the left is the largest one, I added it to a background using metallic paints. I added small ripped pieces of Washi and gold Stickles on top. The Rt side ATC has stickles on top. I used a Unity stamp (the honetcomb) and a strip of Washi on the bottom. The last two ATC's are using a Gelli plate background. I used the same tree die again, I just added Washi and heart sequins from the SU sequins I used the star from. I used a variety of backgrounds and used the small deer from a Gina K designs set- imported in to the scan and cut and cut it out from brown cardstock. I used glue distress, the magazing pape crinkled and gesso'ed, Glue resist x's 2 and a embossed and sanded (coordinations cardstock) technique. 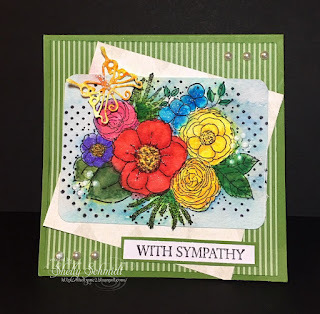 A card for a friend who had a loss in her family. 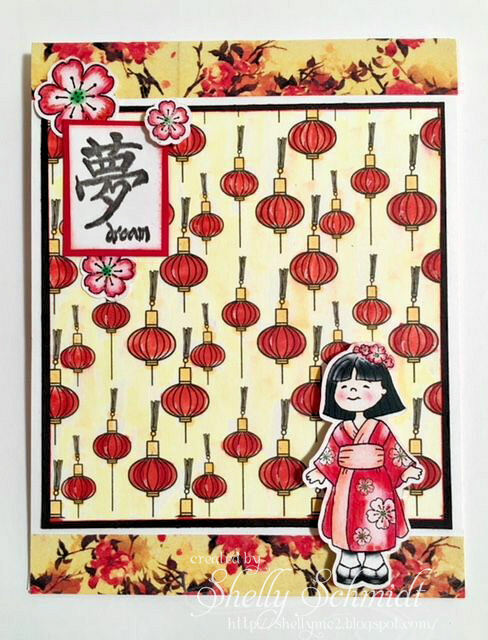 I stamped this Unity image (Dec. 17 KOTM) on Watercolor paper (Strathmore) using a stamping platform. I colored with Zig pens and Artesa waterbrush pens, plus a bit of Wink of Stella. Cardstock and DSP are SU as are the pearls. 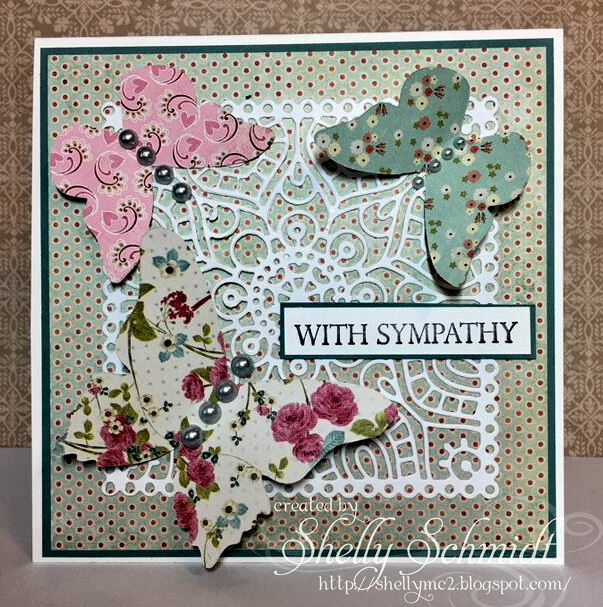 The butterfly die is Cheery Lynn. 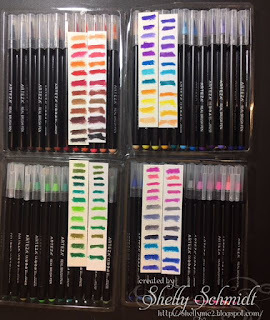 Here is my swatching- Lt on watercolor paper and Rt Neenah cardstock. 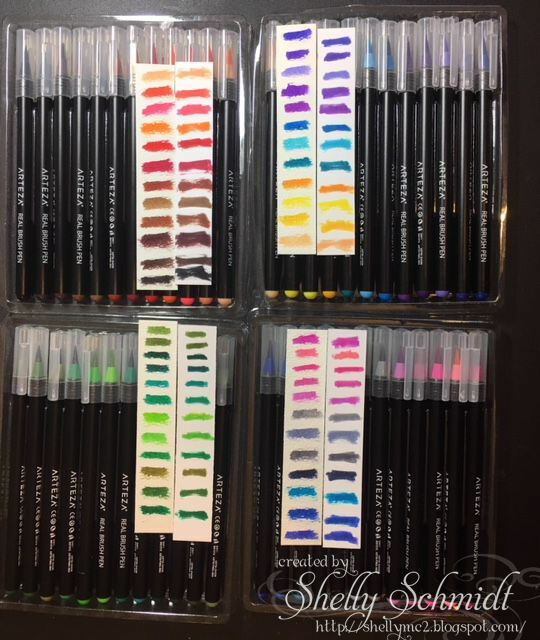 This is my Zig pen collection. You can buy these individually, and they have numbers on them. I will be filling in my collection with the Zigs in the future. Happy Tuesday! Time for another new challenge over at Tuesday Throwdown. This week we have a fun theme for you: "Distressing". 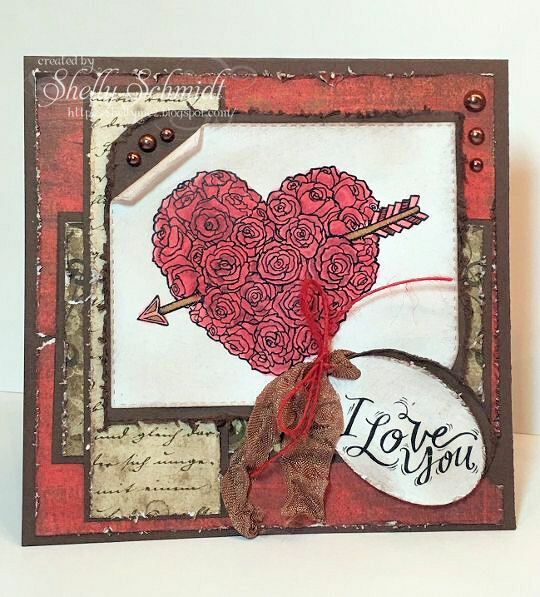 Our sponsor for this challenge is Power Poppy and I used the Follow Your Heart digital image to create a card. The sentiment is from the digi set La Vie en Rose. Copper Pearls- Queen and Co.
Now it's your turn to create a project ! You have a week to play along and 'distress' your card! We look forward to seeing you at Tuesday Throwdown. Stop by and take a look at the inspiration from the Design Team "B"! 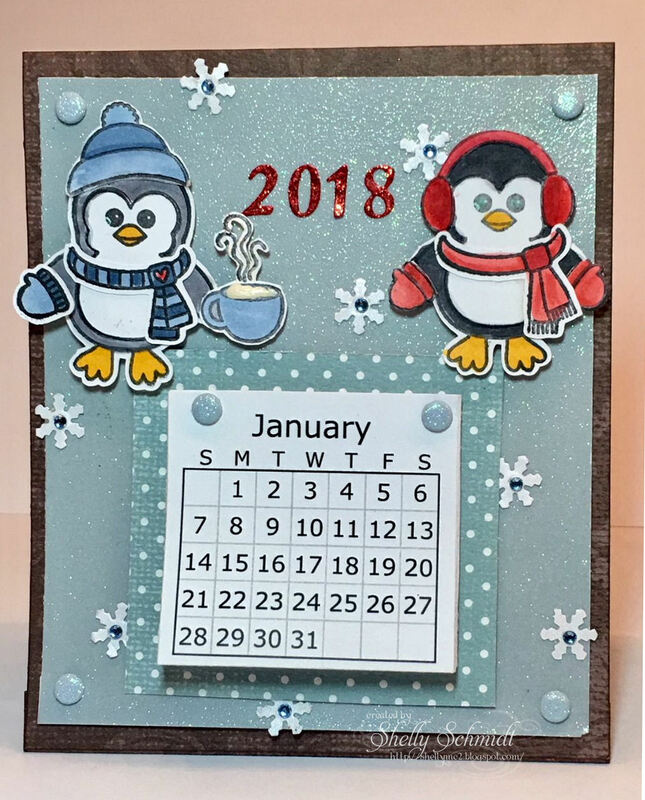 For our January Dueling Darlings kit, Darlene is the Hostess of the Dazzlers, and she sent us a fun kit to make a calendar. (LJ is the Hostess for the Divas). The kit Darlene sent to us included a January page for a calendar. 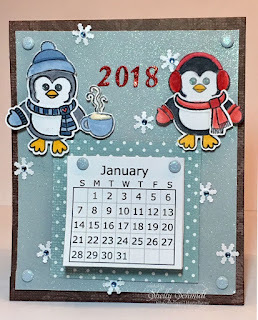 I decided to print out the entire year using a link from the Splitcoaststampers tutorial I used HERE. I stamped and cut out the Sunny Studio Penguins and accessories. They are colored with Copics. I punched out the snowflakes and added rhinestones. The 2018 is red wrapping paper with double stick tape on the reverse- the die- out of the package...... Maybe Memory Box. challenge The challenge is to make a card or another creation that describes how "we" love one another--through friendship, trying times, music, holidays, etc. I am always amazed at the people that say if someone brings you down, you do not need the drama. A really good friend sticks with you through thick and thin IMO. We all have rough times and I think a friend sticks around and helps bring you up, and that you would do the same for your friend if need be. I cut up the edges of the petals and curled them to make the flowers dimensional. Crafters of Faith is an Open group at SCS- you can find the group if you look under Swaps/Cards/Open/Crafters of Faith. Our dear leader is Kelly, and you can find her blog HERE. For the challenge at Tuesday Throwdown, we are using Silver or Gold. I used sequins for my Gold touch. The sweet image is from My Grafico. I colored it with Copics, and cut out the birds and heart and added dimension by adding them popped up over the base images. I added shimmer to the hearts with a red Wink of Stella pen. 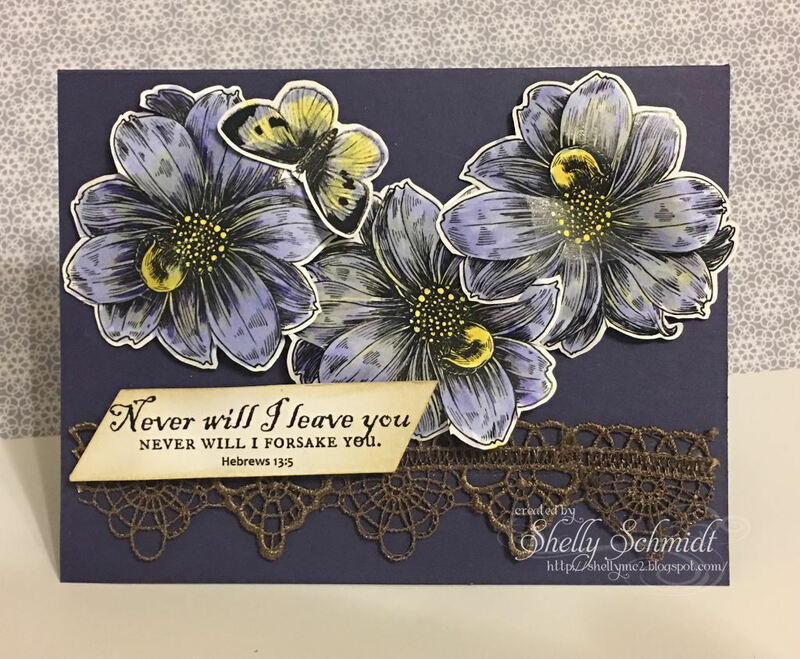 The clouds were made with a punched out scalloped oval punch piece (Stampin Up). The hearts die(s) are spellbinders using Stampin Up DSP. . The LOVE die(s) are Memory Box. The pink and Gold sequins are in my stash.